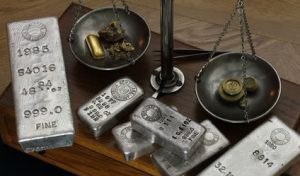 Precious metals declined this week with losses ranging from 0.2% for silver to 5.8% for platinum. U.S. Mint sales of new 2016-dated bullion coins surged. Gold and silver futures rebounded on Friday, boosted by safe-haven buying as world stocks plunged and oil prices dropped below $30 a barrel for the first time in 12 years. Despite the gains, both metals posted their first weekly loss of the year. Gold for February delivery advanced $17.10, or 1.6%, to settle at $1,090.70 an ounce on the Comex division of the New York Mercantile Exchange. "So far in 2016, gold has acted as a fear asset… as money has been flowing out of stocks, crude oil and copper," MarketWatch quoted Taki Tsaklanos, lead analyst at Investing Haven. "We believe this short-term trend will continue for another week, even as stocks and crude oil have reached panic levels and heavily oversold conditions." Gold prices slipped 0.7% on the week after soaring 3.6% last week. On Thursday, they fell 1.2% and closed at their lowest level since Dec. 31. Gold has climbed 2.9% since the end of 2015. Mirroring retail investors’ sentiment, a majority of market professionals are calling for higher gold next week. Out of 34 market experts contacted, 13 responded, of which eight, or 62%, said they expect to see higher prices next week; two professionals, or 15%, said they see lower prices; and three, or 23%, are neutral on gold." Silver for March delivery tacked on 14.8 cents, or 1.1%, to settle at $13.896 an ounce. Silver prices dipped 0.2% this week after advancing 0.8% last week. On Thursday, they tumbled 2.9% to end at their weakest point since Dec. 17. The precious metal is 0.7% higher on the year. April platinum fell $7.30, or 0.9%, to $827.50 an ounce, falling 5.8% from a week ago. Palladium for March delivery lost $4.20, or 0.9%, to $487.05 an ounce, sliding 1.3% on the week. For the year to date, platinum has dropped 7.4% and palladium has dived 13.3%. Gold added $5.35, or 0.5%, to $1,093.75 an ounce. Silver declined 22 cents, or 1.6%, to $13.80 an ounce. Platinum added $4, or 0.5%, to $839 an ounce. Palladium added $7, or 1.4%, to $492 an ounce. Losses on the week totaled 0.7% for gold, 1.7% for silver, 4% for platinum and 2.6% for palladium. The United States Mint released its 2016-dated bullion coins on Monday. Orders for the new coins soared. Gold coins advanced 98,500 ounces on the week with splits of 75,000 ounces in 2016 American Gold Eagles and 23,500 ounces in 2016 American Gold Buffalo coins. Last year’s first week of sales for the new 2015-dated gold coins totaled 63,500 ounces with splits of 45,000 ounces in 2015 American Gold Eagles and 18,500 in 2015 American Gold Buffalo coins. The U.S. Mint is rationing 2016 American Silver Eagles because of silver planchet shortages. The agency set the Silver Eagle sales limit for this week at 4 million coins. The last 500,000 of those were claimed on Friday. Last year’s 2015-dated Silver Eagles scored first-week sales of 3,701,500 coins. The coins went on to score an annual sales record of 47 million before selling out on Dec. 15.